New iPads spark excitement in learning at Blessed Sacrament School. Lerch, along with teachers from Most Holy Rosary, Blessed Sacrament School and Cathedral Academy at Pompei, were trained last June on how to use the iPad and its applications in the classroom. Each of the teachers was given an iPad, and training was provided through professional development grants and/or federal Title funds. Although using the iPad is second nature to many students, the teachers weren’t exposed to the technology like the students were when they were growing up. Lerch is grateful for the training and said she is learning more and more every day. “I’ve become more comfortable with the latest technology and I feel more professional and up-to-date,” she said. 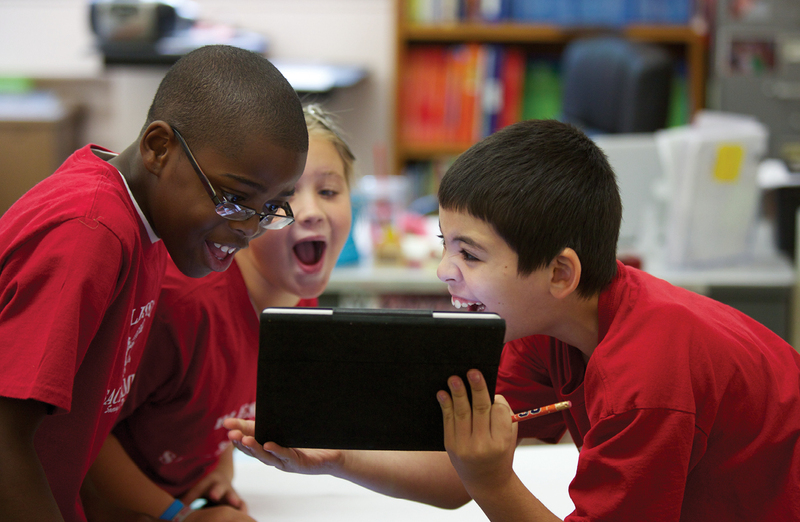 The introduction of the iPad into her classroom has put a new spin on the way her students are learning. The children respond positively to the pictures of vocabulary words that Lerch retrieves instantly with her iPad. As 2nd graders, Lerch’s students are preparing for First Communion. Using a vocabulary checklist of items such as “chalice,” she instantly pulled up images corresponding to each word. “And, I like the quality of the pictures,” she commented, adding that she recently took pictures of a student’s birthday party and then forwarded them to the child’s parents because they were unable to attend. When Lerch uses the Siri app, the students are actively involved in learning. The children ask questions which are answered instantly on the iPad. “The kids love it,” commented Lerch. “It’s a marvelous tool,” said Most Holy Rosary principal Brenda Reichert. 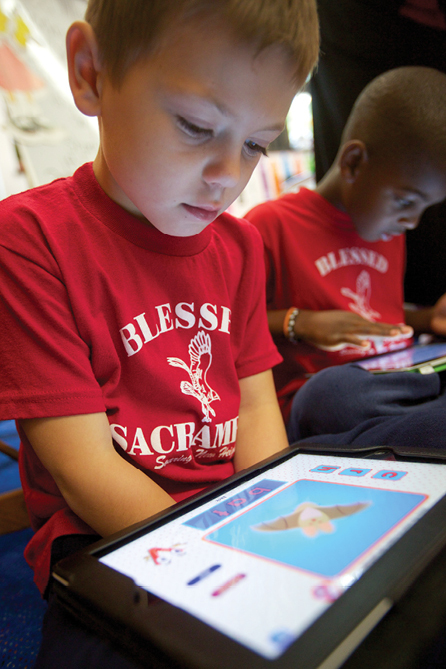 “I love it [the iPad].” She believes that the use of the iPad benefits the students by affording them quick access to various medias and cited the example of the children having access to The Post Standard articles about Mother Marianne Cope’s recent canonization. Reichert said the iPad is also used for development purposes at the school. Videos have been recorded, photos have been taken and information has been added to enhance the school’s website and Facebook page. In addition, the Ticket to Read app has been added to the curriculum, so that students can practice reading and compete with students from around the world.